Google’s Pixel 3 smartphone constantly made it on the news before it was launched through leaked news and rumoirs, as the Mountain View company completely failed to keep its product secret under guard doors. Now since it has finally been launched today, most of the leaked news about its hardware specs and design has turned out to be true. Google at an event today finally unveiled what is remained of the Google Pixel 3 family. Let’s welcome the Google Pixel 3 and Google Pixel 3 XL – Google’s flagship smartphones, and the first in the family to come with support for wireless charging, even though that would mean some extra cash. As far as its design is concerned, it can not be said that there were surprises. It presents the traditional minimalist lines of previous models. Its construction continues to be made of metal, with the upper portion of the rear panel to be constructed of glass. In this glass area, you will be able to find your unique rear camera. Still in the back of this top-of-the-range Android, you’ll be able to find the fingerprint reader. Although it continues to present itself as a rather pleasing design to the eye, by this time we can say that it is already a bit outdated. Or at least a bit saturated, since little or nothing varies when compared to its predecessor. Like the previous generations of the Pixel smartphones, Pixel 3 XL is unarguably the best of the slightly lesser Pixel 3, and that too isn’t without a corresponding price difference. What sets both devices apart are majorly the screen size and battery capacity: while the base Pixel 3 features a 5.5-inch screen, the oversized Pixel 3 XL sports a large, 6.3-inch screen size and a bigger battery. The larger Pixel 3 XL has the same two-tone back with a single rear camera, the infamous display notch, a bottom chin similar to that of the Pixel 2 XL, while the base Pixel 3 misses out only on the display notch. And as expect, both devices feature the squeezable sides as well as the rear the Pixel Imprint fingerprint sensor. The most notable software trick here is what Google calls “Top Shot” mode – a feature that recommends the best from a burst of images from the moment you captured using on-device machine learning, however, in addition to recommending the best, both devices also allow you choose the photo you want to use. The Super Res Zoom, new Night Sight feature, Motion Auto Focus are all part of the Pixel 3 camera tricks. On the rear, the new Pixels are fitted with a single rear camera – the same 12.2MP sensor with a f/1.8 aperture that first featured in last year’s Pixel devices. Google thinks that doesn’t need to be changed, since it can compete with some top 2018 flagships, however, things look completely different on the display front. Both devices get a pair of 8MP sensors with f/2.2 apertures suitable for standard shoots and group selfies. In addition to the Android Pie, you will also have several features available that make this smartphone very interesting. Firstly, it will arrive with the technology “Active Edge” that was released last year. This technology allows you to perform tasks just by squeezing the sides of the smartphone. Powered by a 2915 mAh battery with support for quick and wireless charging. Through the use of the new Pixel Stand, you will be able to charge the Pixel 3 wirelessly in up to 10W. 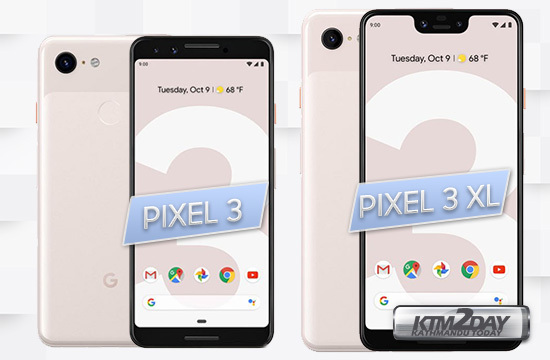 Available in Clearly White, Just Black and Not Pink color options, the Pixel 3 and 3 XL are immediately available for pre-orders and would hit the stores in the US starting from October 19 and Europe from November 2. Both devices start at $800 for the Pixel 3 and $900 for the Pixel 3 XL.